What can compare to flying high above the trees, with an unobstructed view of just about everything! 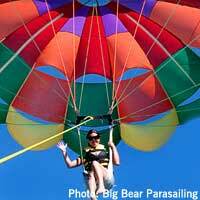 Parasailing in Big Bear is one of those must do activities when you're on your vacation. If you never have ridden in "the chair" you will never understand why this has become one the most sought after vacation activities. Parasailing, also known as "parascending", or "parakiting" is a recreational activity where a person is towed usually behind a boat while attached to a specially designed parachute canopy that reminds one of a wing. On land, or over water, the force propelling the parachute may be a car (yes you can!) or boat. ; The boat then drives off, carrying the parascender or wing and person into the air. If the boat is powerful enough, two or three people can parasail behind it at the same time. The rider has little or no control over the parachute. There are many forms of airlift, and at Big Bear Parasail, they use the winch method. This is where the launch and recovery of the "para sailor" and parachute takes place directly from the boat itself from a platform. The boat is equipped with a parasail inflation system and hydraulic winch powered by the main drive engine to launch and retrieve the para sailor from the flight deck, usually located in the rear of the boat. Winch boat parasailing represents more than 90% of all commercial parasailing offered throughout the world. You can only imagine what the thrill is. With your stomach in your mouth, and you're head swirling with excitement, you have nothing really to worry about. Big Bear Parasail has been around for a long time. Started out of Pine Knot Landing / Marina in 1988. Ted Knight and Wally Weber have been owners since 1994 and both are Big Bear High School alumnis, so they know the water, and the area. Wally's background as a commercial pilot and Hobie Cat racer were just what this business needed to become world class, and because of fligh background, makes him an expert at wind and weather which is the ideal traits for running a business where you are airborne. Big Bear Parasail has flown over 10,000 injury free flights since 1994 and plans to be here for a long time.